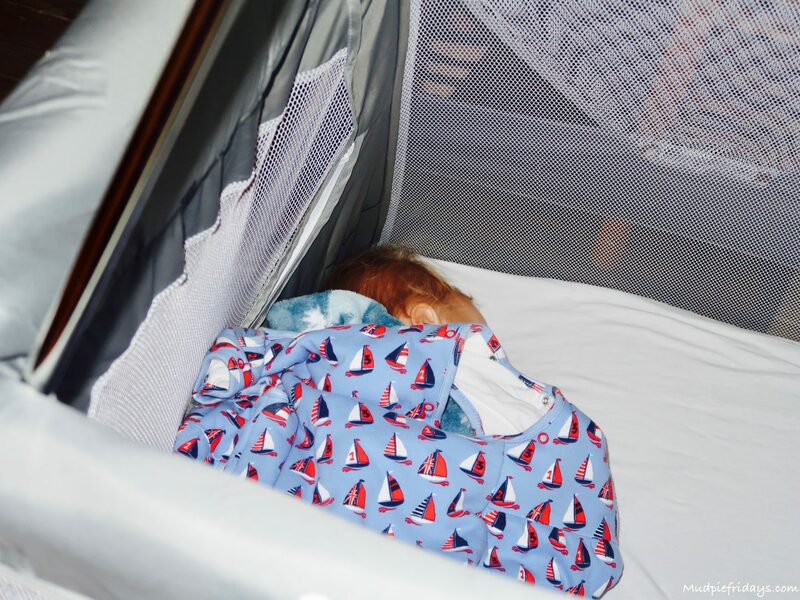 Review: BabyHub SleepSpace Travel Cot: If you are regular readers of Mudpie Fridays then you will know that last year I made a resolution. It was just before I returned to work from maternity leave. I decided we would try and get away once a month as a family. It didn’t need to be anywhere expensive or posh. Just time together as a family away from any home distractions such as the cleaning and homework! You will be pleased to know we managed it! I am super impressed as I didn’t think we would and will be writing all about it soon in my 2017 review. One of the essentials when travelling with a young children is a good travel cot. I much prefer to take my own as I know what we are getting. Ive lost track of the times we have turned up somewhere expecting a cot only to find that its either not there or that its not suitable! For this reason I was excited when Baby Hub got in contact and asked if we would like to try out their SleepSpace Travel Cot. Which we gave our first test run when we visited Port Lympne Animal Park with Panasonic. For me a travel cot needs to be easy to assemble, well made and ultimately Kipper needs to be comfortable. Due to its unique design its possible to put the SleepSpace Travel cot up easily and simply. Ive not tried the one handed trick (as mentioned on their website) but even with two hands it goes up in a matter of minutes. It feels sturdy and well put together. There is padding where I would want to see it around the top, which is where Kipper holds onto the cot. It also covers the hinges on the frame. As far as being comfy is concerned, Kipper seems to love the cot failing asleep and more importantly staying asleep whenever we use it. I think this is in part to the extra mattress included with the cot. Its not very thick but comfortable none the less. The bag had a long strap which reaches from one end to the other which makes it incredibly easy to carry. It also weighs only about 6kg. Although we haven’t needed to use it, the fact it comes with a fitted mosquito net is a big sell for me. We have previously used a separate net with a different cot which didn’t fit very well. I was worried about it the whole time. That isn’t a problem with this one. This also means it can be used an insect free zone while away and is large enough to be a play space too. The way its structured means that there are barriers around each side to protect the baby. 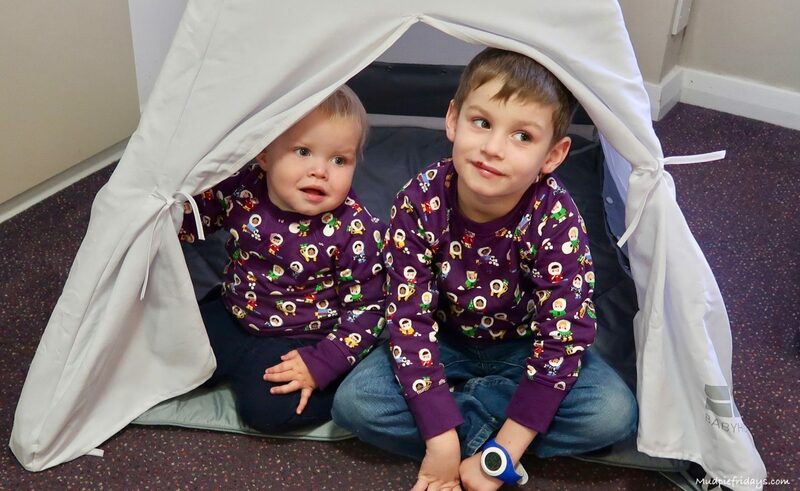 You can also buy an additional teepee which allows the travel cot to have a much longer life span as a tent. 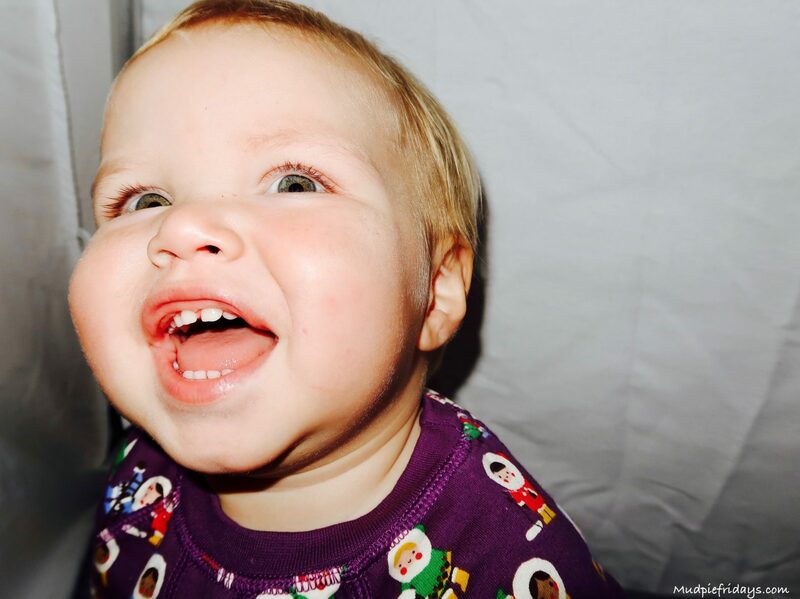 Kipper really is very happy in the SleepSpace Travel Cot which I think speaks volumes. 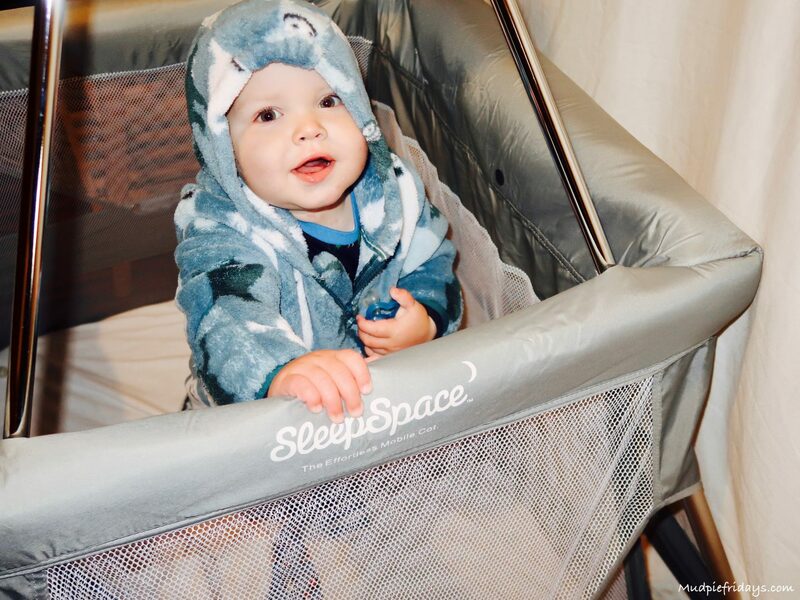 There isn’t anything we don’t like about the SleepSpace Travel Cot. But its worth bearing in mind that this is a large cot. Due to the angle of the frame initially we forgot that it is winder at the base than it is at the top. So we did catch our feet and toes on the frame the first time we used it. We were also sent the Teepee Pack which is a cotton canvas teepee and a floor mat. The mat comes in the same four colours as the travel cot itself. Its designed to be used with the travel cot frame. All you need to do is remove the travel cot covers and the part of the frame, before adding the cotton cover. 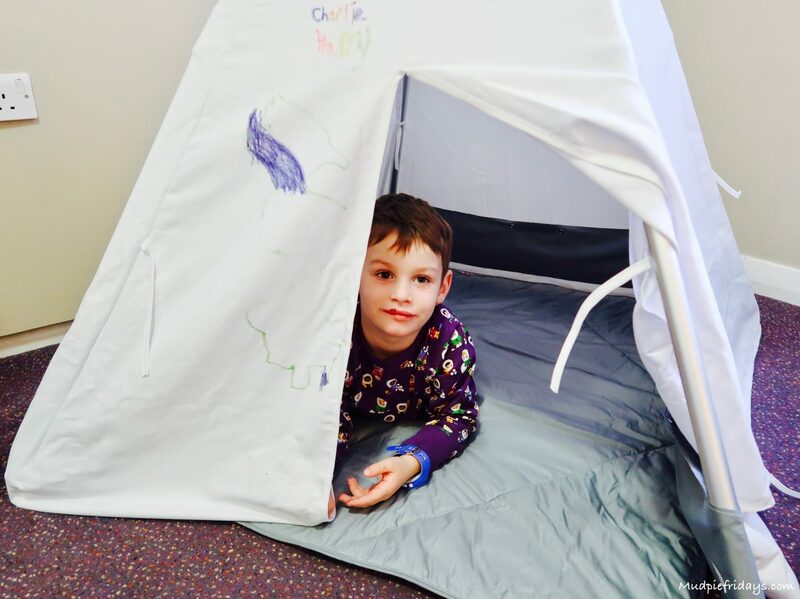 The best part about the teepee is that it can be coloured in and drawn all over with washable fabric pens. Monkey thought it was very exciting to be let loose on it, since he has never been allowed to draw on anything other than paper before. The teepee covers are washable at 40 degrees. When assembled on the frame the teepee measured 120cm in height which is perfect for little ones. The padded mat is 91 x 105 cm so there is lots of room for both boys. I think this is a great idea for a travel cot to have this extra use. It means that we will use it for a lot longer. This is just as well as its on the more expensive end of the market. The BabyHub SleepSpace Travel Cot is available in Pebble, Kiwi, Tangerine and Ruby. Its priced at £169 and you can buy it from their website. The Teepee costs an additional £29 when brought with the cot. 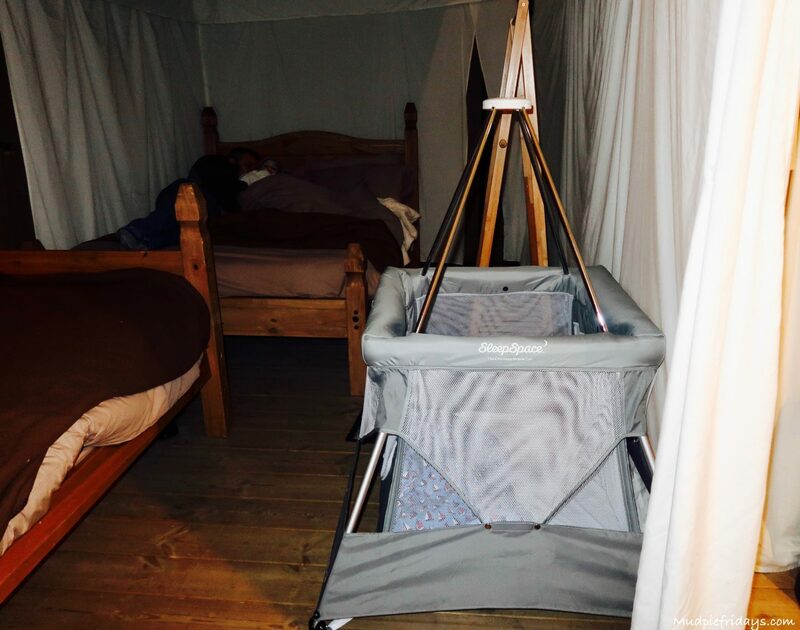 This is a collaborative post, we were given a BabyHub Sleepspace Travel Cot and Teepee for the purpose of this review post. How great you can use it for different things. It looks really good. so much more than just a travel cot, great that it has several uses. What an excellent piece of equipment. I occasionally declined opportunities to visit family and friends overnight because there was no satisfactory substitute for my little one’s cot. This would have been perfect. Oh wow what an amazing idea!!! Although we no longer need a travel cot, I could so have done with that a couple of years ago! The tepee idea is genius! What a great way to entertain kids in a hotel room too! Fab review as always! I am so impressed with this. When we used to travel with the children we often struggled with a travel cot. We had one and it was so heavy to carry and a nightmare to put up. Something like this would have been amazing. It looks so easy to put it up and the ability to be able to do it one handed, if you are holding baby, is brilliant. It looks really comfortable too. What a great find! It seems so versatile! The teepee that can be colored on would be a huge hit in my house! We prefer to take our own travel cot too. The insect net feature sounds very useful for camping etc. I’ve never seen a travel cot that comes with a mosquito net, what a great feature. I think a lot more people are travelling further afield with their babies, so this is definitely something to look into when travelling with a baby or younger toddler. Sounds good. Comfort in essential for any travel cot. I bought a mattress topper to make it extra comfortable for my daughter. ? This looks so good! What a versatile cot and I love it how it made a teepee! It looks cosy, safe and the net feature is brilliant! Travel cots are a god send for when I have my Niece to stay! This looks great the boys have been asking for an indoor teepee and we have been considering buying a travel cot for when family visits – this could kill two birds with one stone. And it’s compact for storage which is also a great consideration. I love the shape of this, I love furniture that is a little bit unusual.